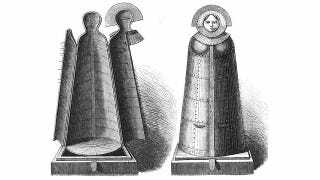 The iron maiden was a horrible medieval torture device, a casket with spikes on the inside which could be closed slowly, impaling the living person inside. It was awful. It was also not real. It was a fake concept popularized by two men in the 19th century, an era not known for impaling people to death. One was Matthew Peacock, a man who spent the 1800s collected paintings and torture devices. He wanted to prove how very much better the then-modern era was than the past. (It's tough to say why he tried so hard to prove it. Not too many people were arguing with him.) The iron maiden, which he pieced together from pieces of memorabilia, was meant to "show the dark spirit of the Middle Ages in contrast to the progress of humanity." He gifted it to a museum, where it has been delighting and horrifying people ever since who believe it was used to torture people in the Middle Ages, even though it wasn't. Peacock wasn't entirely to blame. By the late 1800s, the idea of the iron maiden was firmly cemented in the mind of the public, due to tales from one man. Johann Siebenkees was a philosopher and archaeologist, and in 1793, he decided to perpetrate a little hoax. He wrote about a coin forger in the 1500s who suffered a terrible fate — being enclosed in a casket full of spikes that slowly impaled him. How cruel people were in the past! People took him literally. Even he may not have come up with the idea on his own. It's worth noting that in many of the older fairytales, it was a common fate of evil stepmothers to be sealed up in a cask which had nails driven into it. The cask was rolled down a hill into a lake. All Siebenkees did was take away the water.